My recollection of past Rizon works is a little fuzzy. But that's to be expected. It's been four years, and I've listened to and reviewed more than a thousand new albums since then. 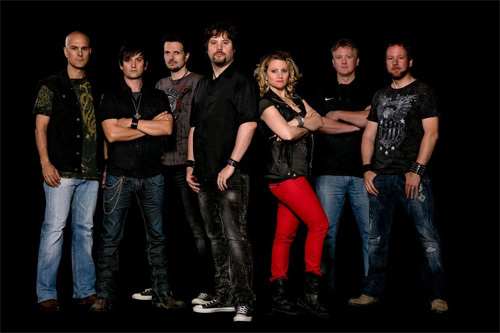 One, Rizon is a large band with seven players, notably two vocalists, male and new female singer Rahel Fischer, and two guitar players. Two, they like to pack a lot of tunes into an album. The previous Masquerade hand thirteen songs. The latest, Power Plant chops things down to twelve, yet better than 52 minutes of music. 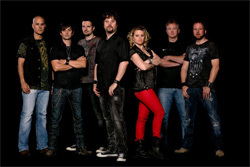 Once more Rizon plays melodic heavy metal with a significant rock groove. But the emphasis is definitely on heavy metal. Most every song boasts sharp and strong riffage with a thundering rhythm section powering them along. 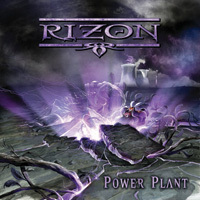 Additionally, as with previous materials, Rizon delivers plenty of lead guitar theatrics, solos abound and sizzle. Synths add atmosphere and embellishment, with the riffage, give Rizon a bombastic impact. Sometimes they have a greater presence as within New Age Dawn, the piano in Freedom Of Life Part 1, and symphonic start of Part II. As for the vocals and vocal arrangement, at the outset Matthias Gotz has the more commanding presence in the first few songs, with Fischer backing him up. But her voice becomes more present in duet with If You Rule The World, then even more prominent in the following Lost Without You, a metal anthem. She takes the lead for I Follow You, before Gotz joins in. In the end, I found the songs I liked best were those that effectively merged the melodic heavy metal with pure groove and more than a little AOR catchiness, namely Nevermore, Timebomb, and Feel The Heat. But fundamentally, Power Plant is Rizon simply being Rizon. They've found their sound in melodic heavy metal, maybe even heavier than in the past. And I think they've finally struck the proper balance between male and female voices. Hopefully, Rahel Fischer will stick around for the next album. All in all, entertaining stuff and recommended. Fundamentally, Power Plant is Rizon simply being Rizon. They've found their sound in melodic heavy metal, maybe even heavier than in the past. And I think they've finally struck the proper balance between male and female voices. All in all, entertaining stuff and recommended.